This tool brings all the main information about Aurifil and it’s fabulous products to your mobile device. 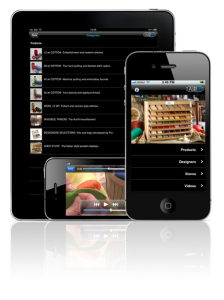 The Aurifil app includes a general overview on Aurifil threads, carefully divided into categories and techniques, a description of all the Designers Kits developed with great names of the quilt world and last but not least, a view of all display options for quilt shops. The Designer Area includes pages dedicated to each designer ,who are our first supporters, with pictures and hints on the use of Aurifil threads.The video section includes our designers at some of the greatest quilt shows and events that you do not want to miss. The main area is the Store Locator. Listing all the quilt shops for all users of mobile devices, this feature enables you to find the nearest store including directions with the help of Google Maps. It’s often possible to see the shop window and each quilter can leave a comment about the shop itself, rate it and get all contact details (phone, e-mail and website). For Shop owners, the only requirement to get FREE enrollment to be included in this app being a vendor of Aurifil threads. Inside the shop main page, the shop owners can also provide a short description of their business.